How do miners “quarry” sand? Use our resource to learn more. A sand quarry stretches along the banks of the Kaveri River in the state of Tamil Nadu, India. Sand mining is a multi-billion dollar industry, practiced legally and illegally around the world. What is mined sand used for? cement and concrete. The primary use for the billions of tons of sand mined around the world is concrete. Concrete is a hard, durable, easily accessible building material made from mixing cement with rock and water. “Between 1994 and 2012, global cement production—a proxy for concrete use—tripled, from 1.37 billion to 3.7 billion tons, driven largely by Asian construction, according to a 2014 report from the United Nations Environment Programme (UNEP).” Learn how cement is made from folks who would know—the Portland Cement Association. land reclamation. Wetlands and coastal lands around the world are being drained to create land for housing and industry. Most of the land used in land reclamation projects is sand that has been dredged or mined. Take a look at one of the world’s most famous land reclamation projects—the artificial islands of “The Palm” and “The World” in the United Arab Emirates. road deicing. Sand, along with salt, is often used to lower the melting point on snowy roads. Learn more about deicing from the good folks at Wonderopolis here. fracking. In the U.S., the ongoing, billion-dollar “sand rush” is largely driven by hydraulic fracturing, also known as fracking. In the fracking process, cracks in and below the Earth’s surface are opened and widened by injecting water, chemicals, and sand at high pressure. These cracks allow for petroleum extraction. Learn how fracking works with our great video resource here. modern life as we know it. According to Science, “sand is an essential ingredient of nearly every modern highway, airport, dam, windowpane, and solar panel” on the planet. There are millions of tons of beautiful sand in the Sahara, Gobi, Great Sandy, and other sandy deserts around the world. Why are mining interests focusing on estuarine and coastal lands for sand quarries? Titanium- and zirconium-rich sands make building materials more resistant to saltwater corrosion. The silica-rich sand plentiful in Wisconsin and Minnesota is the preferred type of sand used in fracking operations. Read through the great, short Science article. What are some examples of how sand mining is impacting organisms in quarrying areas? The habitats of riparian animals throughout South and Southeast Asia are put at risk by sand mining. The Science article mentions several species of terrapin, which lay their eggs in the same beaches every year. These nesting sites are disturbed and even destroyed by dredging. Gharials, a critically endangered species of crocodilian, are also threatened by sand mining. Gharials lay their eggs in riverside sand, and young gharials rely on shallow-water ecosystems to feed on fishes and crustaceans. These habitats are threatened by sand mining. How is sand mining impacting the built environment, or constructed parts of a landscape? coastal erosion. Sand mining severely increases the instances of coastal erosion. Coastal erosion impacts infrastructure (such as bridges and roads), local industry, agriculture, and housing. Coastal erosion also radically weakens the ability of the coast to resist severe storms, making coastal communities more vulnerable to flooding and high winds. river management. 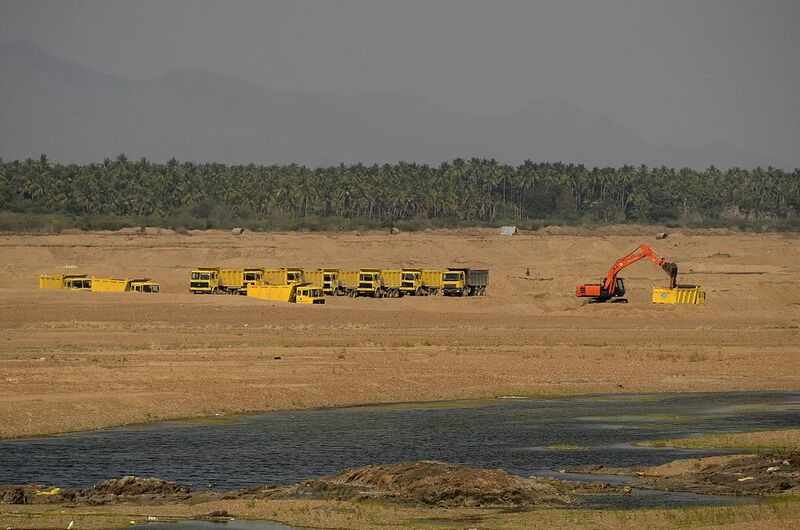 Sand mining can alter the course of rivers and streams, changing flood patterns and marine currents. How do scientists, engineers, and policymakers recommend mitigating the impact of sand mining? Tough question, as issues such as rapid development, land reclamation, and fracking are very controversial. Stakeholders include local communities and multinational corporations, working-class miners and billionaire businessmen. This is a fantastic piece! Thank you NatGeo! I’d also like to submit http://www.sandstories.org for more information. For all the visual learners out there, you will find a short video that offers a brief introduction to the topic and the community resources section offers a great starting point. Feel free to use them in your classrooms.